Let your inhibitions run wild and indulge your hedonistic fantasies with some well deserved down time at the Anantara Resort & Spa in Hua Hin. Although it’s only a short two and a half hour drive from Bangkok, this evocative hideaway has the ability to transport you to another world. 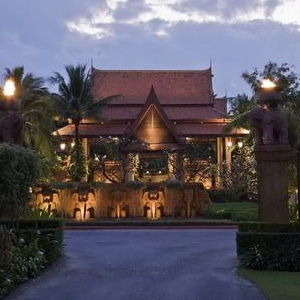 Nestled on 14 acres of pristine tropical coastline, Anantara feels like “paradise found” from the moment you arrive. This seaside resort reveals one hidden treasure after another with memorizing white sand beaches, lush secret gardens, two seductive infinity-edge swimming pools, seven onsite restaurants and bars, and a full service spa that is second to none. Drive along Hua Hin's Petchakasem Rd.